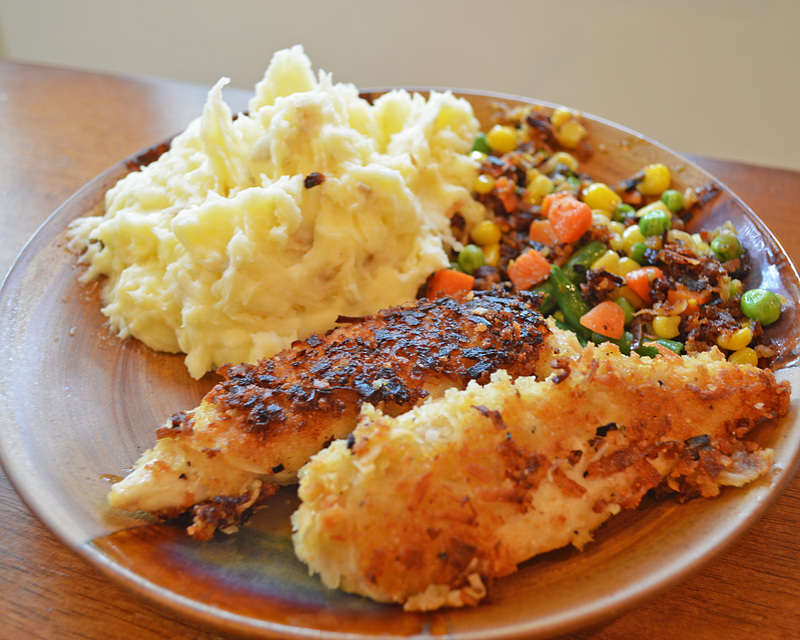 Crispy Coconut Encrusted Chicken with Mashed Potatoes – Dancin' and Cookin' in the Kitchen! Above is the end product! YUM huh?! Soak the chicken tenderloins in the coconut milk (either in a baggie or like I did, in a pie pan) for 45 minutes to an hour. While it’s soaking, mix the flour with 1/2 tsp salt and pepper and mix. Heat the oil in the skillet on medium-high. Then, take the panko bread crumbs, scallions and coconut and mix in a second bowl. Take the chicken, dip in flour, dip back into the milk and then coat with the coconut and panko bread crumbs. Make sure well coated. Cook in the skillet on med. high for 4-5 minutes per side until cooked through and firm. Peel most of the potatoes, and leave just a little bit of the peel. Then cut into 2 inch pieces. 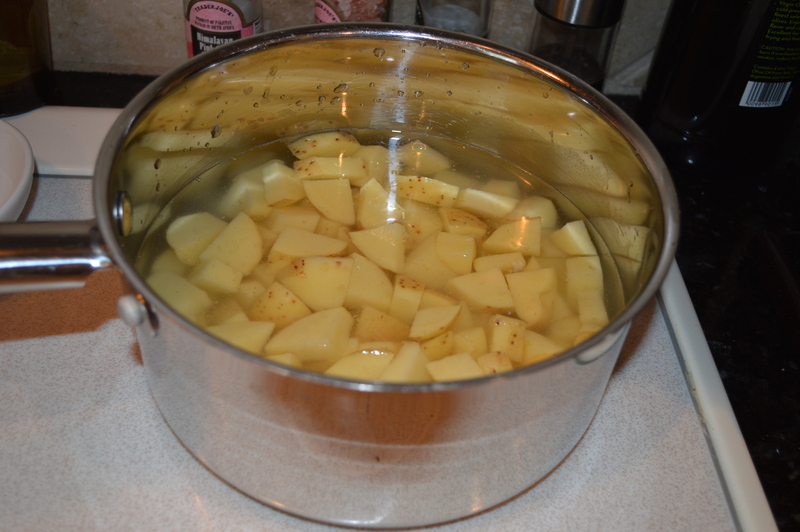 Place into pot and cover (just over the top) of the potatoes. Boil for 15 min on medium high. Lower the temp. if it boils over. I place the lid on the pan, but not sealed… it’s slightly “propped”. This helps to keep it from boiling over. Then, when cooked through, a fork should easily go through the pieces of potato, if not immediately cause it to break apart. Drain water, and place back on warm (and turned off) burner. Add the half&half (or chicken broth), butter, and yogurt. Mash with potato masher, or similar. 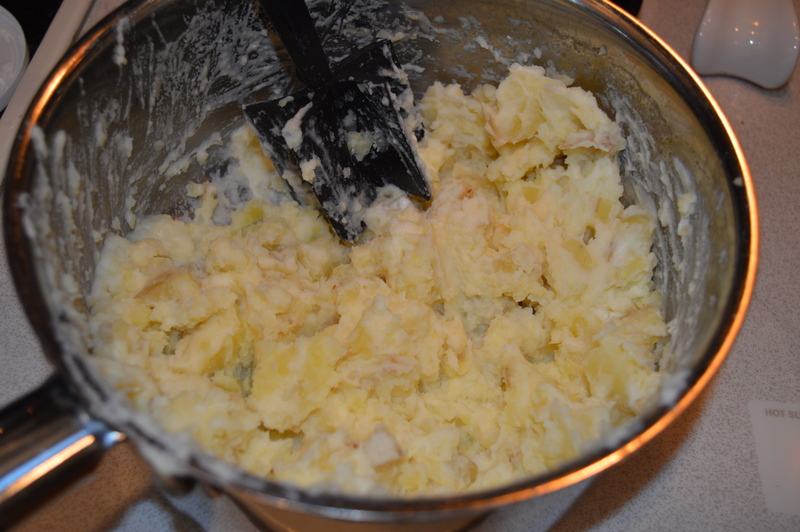 Then, when well mixed, if you want creamy potatoes, take a hand mixer and blend. Then season to taste. This entry was posted in Uncategorized and tagged chicken, coconut, coconut milk, coconut oil, mashed potatoes, vegetables. Bookmark the permalink. Pingback: Short Ribs – Served 2 Ways… and mighty good either way!!! 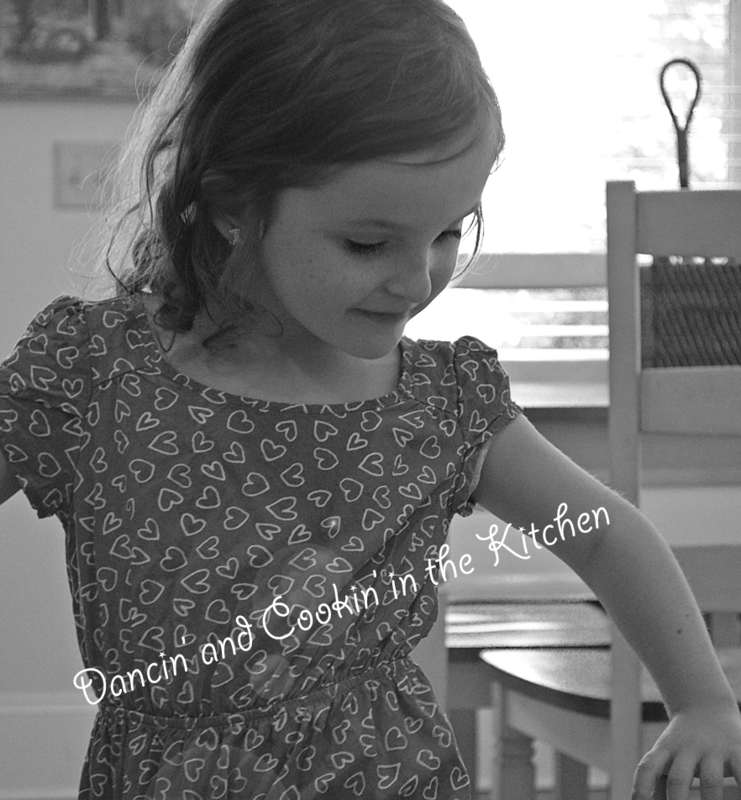 | Dancin' and Cookin' in the Kitchen!